Abstract: In view of the deficiencies of current surveying methods of gas station, an approach is proposed to extract gas station from vehicle traces. Firstly, the spatial-temporal characteristics of individual and collective refueling behavior of trajectory is analyzed from aspects of movement features and geometric patterns. 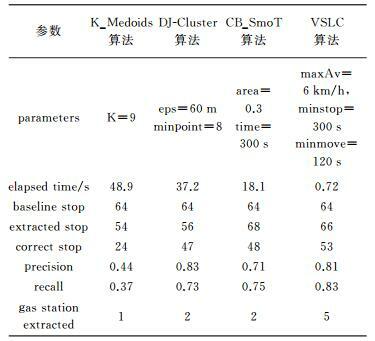 Secondly, based on Stop/Move model, the velocity sequence linear clustering algorithm is proposed to extract refueling stop tracks. Finally, using the methods including Delaunay triangulation, Fourier shape recognition and semantic constraints to identify and extract gas station. 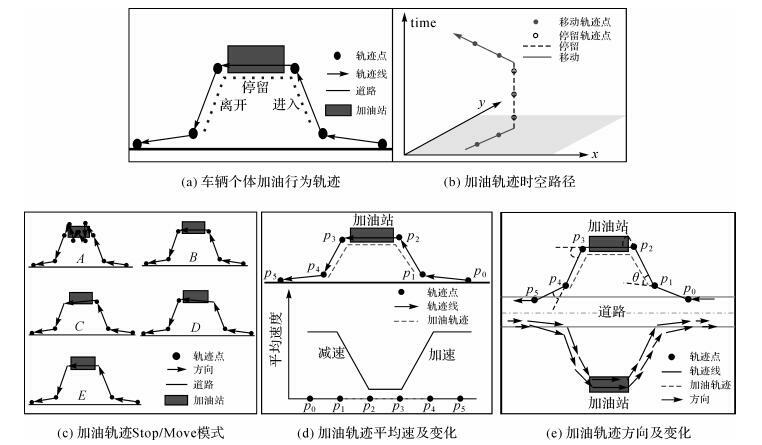 An experiment using 7 days taxi GPS traces in Beijing verified the novel method. The experimental results of 482 gas stations are extracted and the correct rate achieves to 93.1%. 李军, 秦其明, 游林, 等. 利用浮动车数据提取停车场位置[J]. 武汉大学学报(信息科学版), 2013, 38(5): 599–603. LI Jun, QIN Qiming, YOU Lin, et al. Parking Lot Extraction Method Based on Floating Car Data[J]. 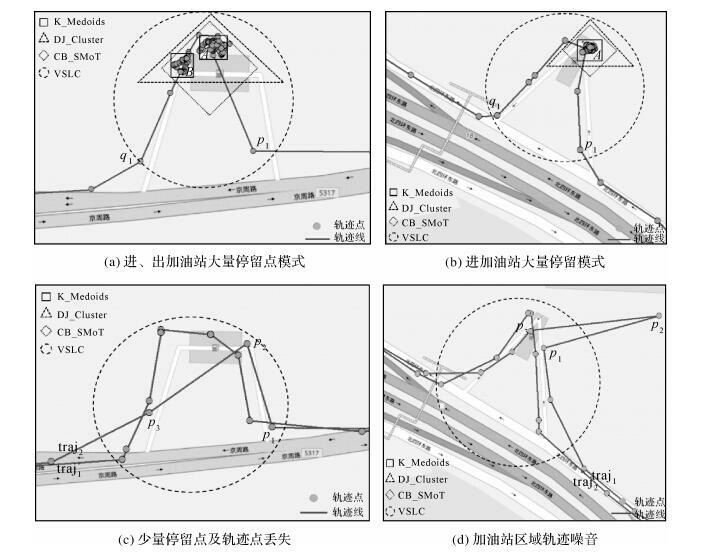 Geomatics and Information Science of Wuhan University, 2013, 38(5): 599–603. 王明, 李清泉, 胡庆武, 等. 面向众源开放街道地图空间数据的质量评价方法[J]. 武汉大学学报(信息科学版), 2013, 38(12): 1490–1494. WANG Ming, LI Qingquan, HU Qingwu, et al. 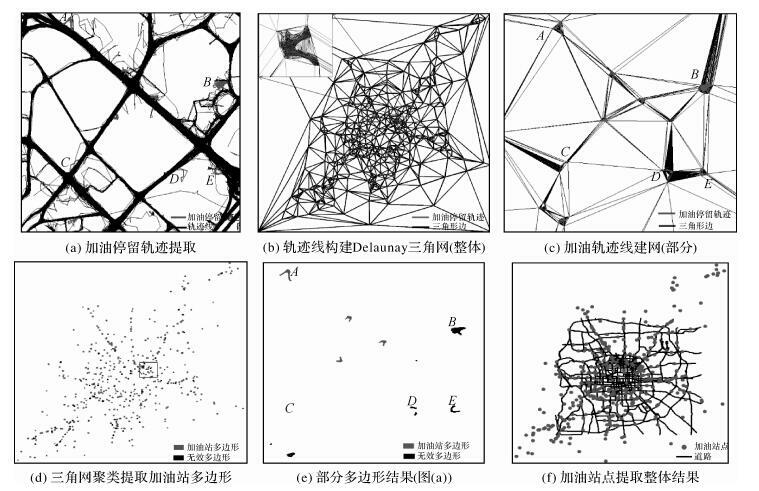 Quality Analysis on Crowd Sourcing Geographic Data with Open Street Map Data[J]. Geomatics and Information Science of Wuhan University, 2013, 38(12): 1490–1494. ZHENG Yu. Trajectory Data Mining: An Overview[J]. ACM Transactions on Intelligent Systems and Technology (TIST), 2015, 6(3): 29. 萧世伦, 方志祥. 从时空GIS视野来定量分析人类行为的思考[J]. 武汉大学学报(信息科学版), 2014, 39(6): 667–670. XIAO Shilun, FANG Zhixiang. Rethinking Human Behavior Research from the Perspective of Space-time GIS[J]. 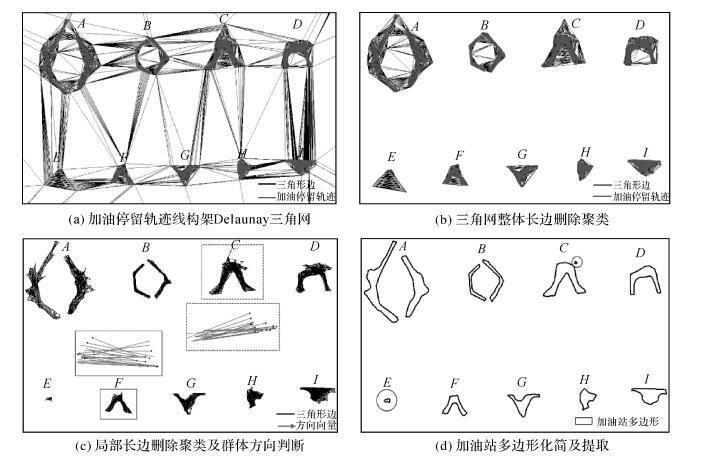 Geomatics and Information Science of Wuhan University, 2014, 39(6): 667–670. 杨伟, 艾廷华. 基于众源轨迹数据的道路中心线提取[J]. 地理与地理信息科学, 2016, 32(3): 1–7. YANG Wei, AI Tinghua. Road Centerline Extraction from Crowdsourcing Trajectory Data[J]. Geography and Geo-Information Science, 2016, 32(3): 1–7. SONG Qiuge, JIN Cheqing, WANG Xiaoling, et al. Discovering Underpasses from Walking Trajectories[C]//Proceedings of the 2015 31th IEEE International Conference on Data Engineering Workshops. Seoul: IEEE, 2015: 129-133. ZHANG Fuzheng, WILKIE D, ZHENG Yu, et al. Sensing the Pulse of Urban Refueling Behavior[C]//Proceedings of the 2013 ACM International Joint Conference on Pervasive and Ubiquitous Computing. New York: ACM, 2013: 13-22. NIU Hongting, LIU Junming, FU Yanjie, et al. Exploiting Human Mobility Patterns for Gas Station Site Selection[C]//International Conference on Database Systems for Advanced Applications. Dallas: Springer International Publishing, 2016: 242-257. ALVARES L O, BOGORNY V, KUIJPERS B, et al. A Model for Enriching Trajectories with Semantic Geographical Information[C]//Proceedings of the 15th Annual ACM International Symposium on Advances in Geographic Information Systems. New York: ACM, 2007: 22. SPACCAPIETRA S, PARENT C, DAMIANI M L, et al. A Conceptual View on Trajectories[J]. Data & Knowledge Engineering, 2008, 65(1): 126–146. PALMA A T, BOGORNY V, KUIJPERS B, et al. A Clustering-based Approach for Discovering Interesting Places in Trajectories[C]//Proceedings of the 2008 ACM Symposium on Applied Computing. New York: ACM, 2008: 863-868. ROCHA J A M R, TIMES V C, OLIVEIRA G, et al. DB-SMoT: A Direction-based Spatio-temporal Clustering Method[C]//Proceedings of the 2010 5th IEEE International Conference Intelligent Systems. London: IEEE, 2010: 114-119. 刘启亮, 邓敏, 石岩, 等. 一种基于多约束的空间聚类方法[J]. 测绘学报, 2011, 40(4): 509–516. LIU Qiliang, DENG Min, SHI Yan, et al. A Novel Spatial Clustering Method Based on Multi-constraints[J]. Acta Geodaetica et Cartographica Sinica, 2011, 40(4): 509–516. 王涛, 刘文印, 孙家广, 等. 傅里叶描述子识别物体的形状[J]. 计算机研究与发展, 2002, 39(12): 1714–1719. WANG Tao, LIU Wenyin, SUN Jiaguang, et al. Using Fourier Descriptors to Recognize Object's Shape[J]. Journal of Computer Research and Development, 2002, 39(12): 1714–1719. 中华人民共和国住房和城乡建设部, 中华人民共和国国家质量监督检验检疫总局. 汽车加油加气站设计与施工规范: GB 50156—2012[S]. 北京: 中国计划出版社, 2013.